Seriously, I am just in a lunch rut all together right now. If it weren't for the fact that my kids can't buy lunches at school, I don't think I'd be making them. We seem to be stuck with the same few things again and I hate that. However, we are off from school next week, so it's a chance to do some shopping and try out some new recipes and hopefully come back with something better after Thanksgiving. 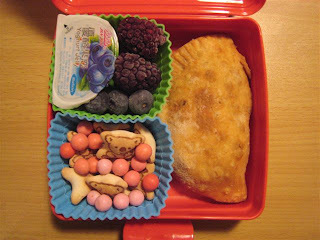 Until then, Ben is taking an empanada, blueberry yogurt, blueberries & blackberries (they are frozen, not fuzzy! ), some Koala cookies and some yogos that Faith gave him. I added a couple of carrot sticks after the picture, but forgot to take a picture of them too. So picture in your mind a few baby carrots.